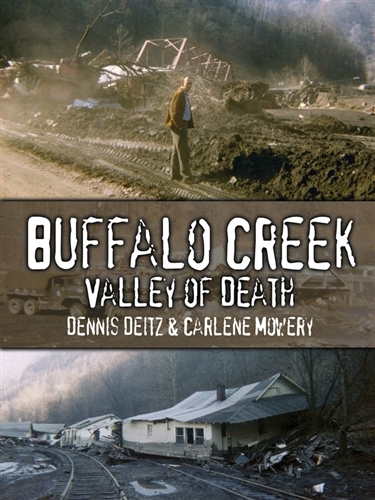 Buffalo Creek: Valley of Death is a reprint of a classic title by Dennis Dietz and Carlene Mowery. It tells the story of a cold day in February 1972, when 125 people lost their lives to a 25-foot tidal wave of water, sludge, and debris running through narrow, 17-mile Buffalo Creek Valley. The wave was released when an impoundment dam-owned by Pittston Coal and used to filter the black waste-water-burst. Buffalo Creek was the worst mining disaster in West Virginia's history, and was on the national nightly news for over a week. Authors Carlene Mowery and Dennis Deitz compiled a fascinating collection of first hand accounts from 98 of the disaster's survivors. Buffalo Creek contains very personal accounts of what the town's citizens were doing immediately before the flood, and the anguish and pain they experienced watching loved ones and neighbors perish. Reading the survivors' accounts is both heart-breaking and spellbinding. The photographs of the people and property that accompany each story begin to bring home the immense loss suffered by this group of people, a group whose lives were changed forever in just a few terrible moments. In addition to the authors' personal interviews with the flood victims, a section in the back of the book contains testimonials from the Senate Subcommittee's investigative interviews in the weeks and months following the disaster. Also included is testimony given by a panel of Pittson Coal Company officials. In the days preceding February 26, 1972, rain had fallen almost continuously in the Buffalo Creek area, although experts later claimed this was typical late winter weather. Buffalo Mining officials, concerned about the condition of the highest dam, measured water levels there every two hours on the night before the disaster. Although a Pittston official in the area was alerted to the increasing danger, the residents of the hollow were not informed. When two deputy sheriffs were dispatched to Buffalo Creek to assist with potential evacuations, the company sent them away. Despite the lack of warning from company officials, some residents sensed the danger and moved to higher ground; unfortunately many did not. Just prior to 8:00 a.m. on February 26, heavy-equipment operator Denny Gibson discovered that the water had risen to the crest of the impoundment and that the dam was "real soggy." At 8:05 a.m., the dam collapsed. The water obliterated the other two impoundments and approximately 132 million gallons of black waste-water rushed through narrow Buffalo Creek. In a matter of minutes, 125 were dead, 1,100 were injured, and over 4,000 people were left homeless. One thousand cars and trucks were destroyed. The flood demolished 502 houses and 44 mobile homes, and severely damaged 943 houses and mobile homes. Property damage was estimated at $50 million. 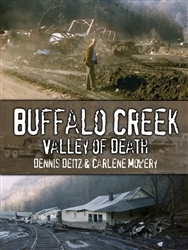 Buffalo Creek includes exclusive interviews from many of those who witnessed and survived the flood. This revised edition of the book includes new, never-before-published photos from the tragic event. While the story of the flood itself is devastating, the survivors' heroic efforts to save each other and themselves-after enduring tremendous personal and material loss-are truly inspirational.